Richmond Swims offers a Pre-Swim Team course for Richmond youth, age 6-15. This lesson program is for kids that know how to swim and think they might be interested in joining a swim team in the future, but need a bit more practice before they would be comfortable signing up for a team. 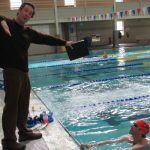 Coach John Schonder and his assistants will introduce the competitive swim strokes, instruct swimmers on their stroke technique, and teach pool etiquette for workout swimming. Those who enjoy the class, have the option of signing up for the Richmond Sailfish swim team at the conclusion of the course. Sailfish teammates continue building their endurance and swimming skills, attending regularly scheduled practices at the Plunge. To qualify for the class, each student must be able to tread water for one minute, swim a minimum of 20 yards, and transition from swimming on their stomach to their back and vice versa. The cost is $30 for 6 lessons. The Pre-Swim Team is a series of six, low-cost, swimming classes. The next session of this lesson program has not yet been scheduled. If you are interested in this program and would like us to email you the next time it is offered, click here to add yourself to our informational list. If you have received confirmation for a specific session, you will need to download and fill out these forms. Please bring the completed versions of them with your child on the first day of class.